After many visits to Wuppertal, have now managed to get the classic shot in sun of the Schwebebahn at the Vohwinkel end of the line where it runs above the main shopping street for half a mile (the rest of the 8 mile route is mainly above the river Wupper). 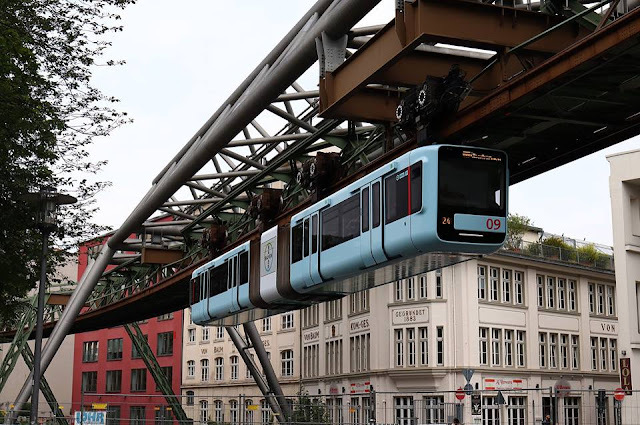 There was only one spot where you can get about the same height as the tram - the first floor of a Netto store, and because of a double gantry (seen on the left) there is a bigger gap before the next gantry so that the whole of the tram fits in. Because the original building next door is demolished and now a car park, sunlight now gets onto the whole structure and the tram. It has to be an early morning shot, as very soon the tram is covered in shadow from the overhead. 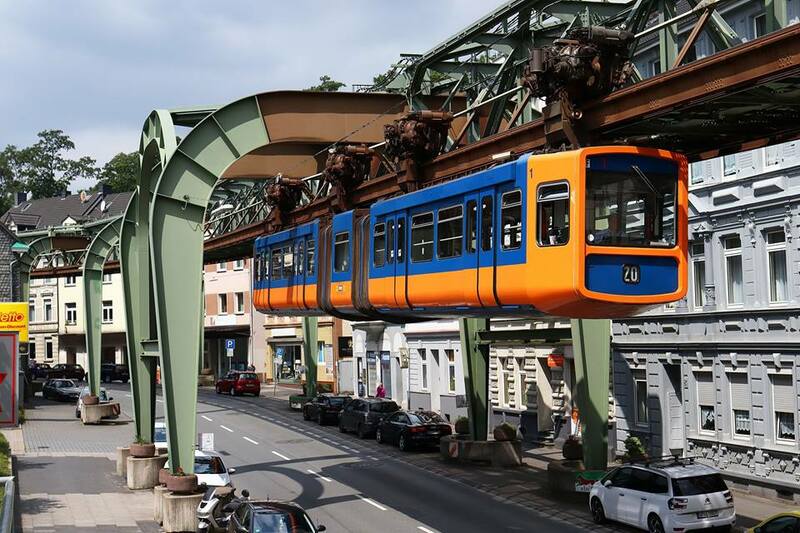 The new trams on the Schwebebahn in Wuppertal are very bland compared to the old. At the moment, about half the trams are old, and half new, with about half of the old ones being in advert livery. All the new trams have an advert on the centre section, and the underneath only. 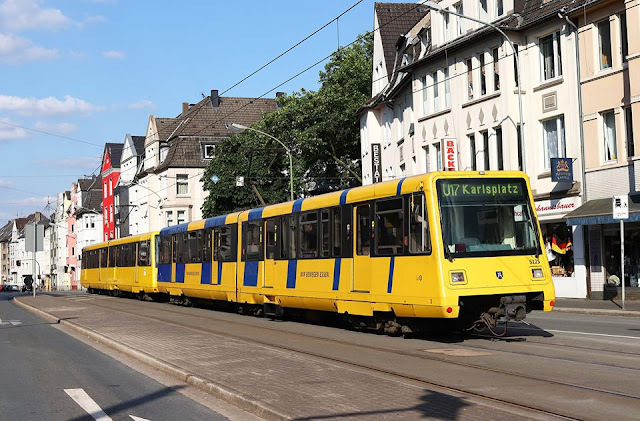 The ex-Docklands trains are still running in Essen, and are now in 3 slightly different liveries. The nearest unit is in the first livery (with blue bands). The furthest unit is in the 3rd livery (a brighter yellow with no bands). The 2nd livery just had some blue above the windows. 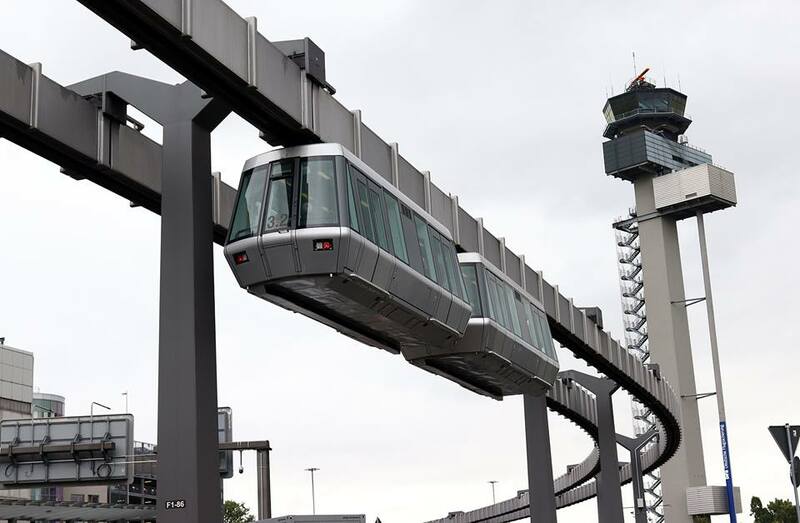 Dusseldorf Airport has a Skytrain to access the terminals and car parks, seen here with the control tower in the background. Everything at this airport seems to be in various shades of grey ! 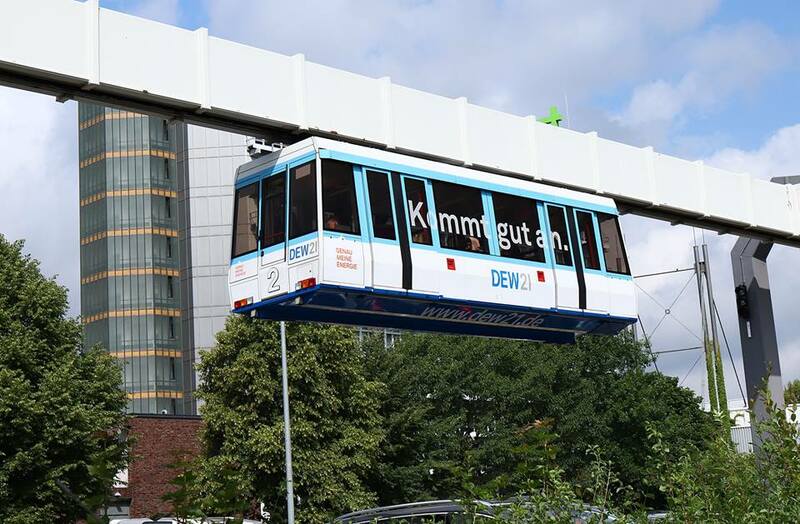 Dortmund University is a huge campus, and there is a 3-line H-bahn to enable students to access the different sites and halls of residence.